Ageing And Youth Unemployment "Unemployment refers to the condition of being unemployed, or to the number or proportion of people in the working population who are unemployed." 1There are different types of unemployment, which includes frictional, structural, regional and cyclical unemployment. Frictional unemployment, the main type of unemployment is when people are between jobs. I am going to discuss the problems of ageing and youth employment and also the ways in which the government's can respond to these problems. "About 1.1 million companies, or 77 per cent of employers, hire fewer ethnic minority and older employees than they should based on the workforce composition in their location. "2 The experience of the seniors are a cause for them believing that they deserve higher wages. Furthermore all of that experience would go to waste if the seniors were to all of a sudden retire or chances of them passing away increase with age. ...read more. A few measures, which can be undertaken by the government to prevent this ageing unemployment by subsiding companies to ensure, they keep a balance of aged with younger workers in the firm. The companies can also give the senior employees in the companies consulting roles. The companies can also encourage flexible work schedules, which encourage older workers to stay on the labour force. Another interesting idea for firms to try and do with their employees is to form some sort of retirement plan with the workers to make sure that all that experience won't go to waste. According to the OECD, 'older workers are more expensive than younger workers, because of higher remuneration, fringe benefits and social contributions.' But some companies don't see this being the case. As the training costs for the younger workers will be far more expensive, companies are better of just keeping the senior worker. ...read more. Figure 2 - Production Possibility Frontier To solve this problem of youth unemployment, the government can set up free training schemes for the youths. In addition they could publicize jobs, which can be undertaken by the younger workers by advertising. This will also make the workers more aware about what skills they have to offer to the labour market. 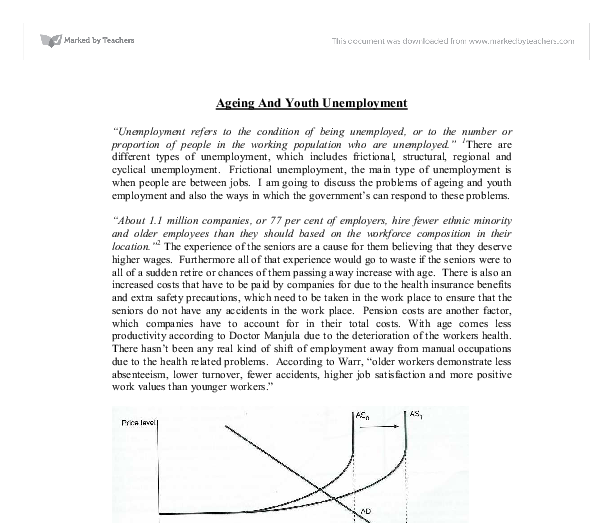 After carefully analyzing the unemployment of the youth and senior workers, I have come to believe that it is pivotal to have a balance of the workforce with the younger and senior workers as this means that all the experience of the seniors can be passed on to the younger workers if the companies take the chance to accept this fact. In the short run, for companies' costs will be high for employing the younger workers but in the long run, after that experience is achieved they can be more productive. 1 - http://william-king.www.drexel.edu/top/prin/txt/probs/Ch5_unemdef.html 2 - http://money.guardian.co.uk/work/story/0,,1712837,00.html (The Guardian) 3 - http://money.guardian.co.uk/work/story/0,,1543484,00.html ...read more. 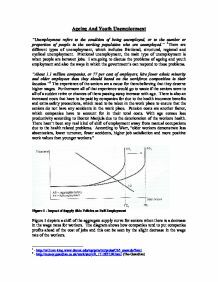 Although one might argue that in the long term, more competetive and efficient workers will be hired, thus contributing more to their jobs. In 1980, Tees street was hit hard by the recession. Before the recession, there were 14,000 available jobs, now only 1300. This could be a consequence of government intervention to raise the level of wages through the NMW. On the other hand it may be that the rate of change is falling as the economy is nearing its level of full employment. These two diagrams describe one economy. The rising price level in the first diagram is shown by the increased inflation rate in the second diagram. The temporary rise in the level of real output in the first diagram is illustrated by the temporary fall in unemployment in the second diagram. This raises the equilibrium level of unemployment. Trade union power cannot solely account for the disparity in experience across the OECD countries. Firstly, union density was also rising in the small non-EC European countries whilst unemployment was not taking off. The first of these, cyclical or demand deficient unemployment is based around what will happen to demand in a recession. When the economy goes into a recession there is a rise in unemployment as there is insufficient demand within the economy. Cyclical Unemployment: Many people are have qualifications for jobs but cannot get a job. This is because as the economy begins to slow down basically there is not enough demand to employ all these workers. This type of unemployment is part of why the there is a change in output, due to the cycles of the economy.